The Honour Roll commemorates former pupils of the school who served in World War One. The roll, which was presented by Mr. J. Goyne, was unveiled in 1916 and contained 23 names. Additional names were added to the roll at a later date. The honour roll is fading, except for one name, that being "H D Willis MM" which has been repainted in the past few years but no others. However the MM annotation is incorrect as Lieutenant Herbert Duncan Willis, of the 38th Battalion, which was the called the 58th Battalion was awarded a Military Cross, not a Military Medal. On Saturday afternoon and evening a bazaar was held in the Epsom school in aid of the War Relief Fund for returned soldiers. 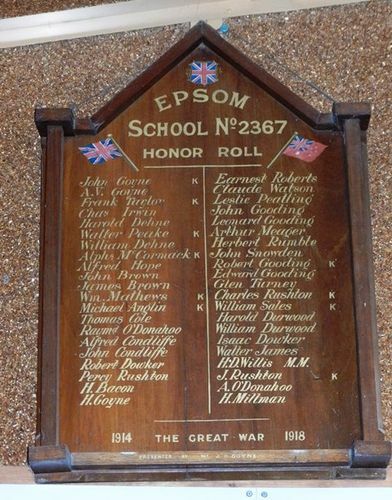 Mr. Delbridge, on behalf of Mr. J. Goyne, presented to the school a very fine honor roll, containing 23 names of old scholars who have joined the colors from Epsom. In doing so he stated that in his opinion the unanimity displayed by the people that evening showed that even if their political opinions differed they were determined to see the war through to final victory, even if it meant "the last man and the last shilling." The head teacher, in thanking Mr. Goyne for his splendid gift to the school, said that the honor roll would be something for the boys at present attending school to respect and cherish, for it represents "patriotism," without which no country could be truly great. The boys of the future would want to know what the honor roll means and when they were told of the splendid deeds of our Australian soldiers, he could, in imagination, see their eyes light up with pride and read in their countenances an inward resolve to be worthy of a country which reared such men. Bendigo Independent (Vic), 7 November 1916. Presented by Mr. J. D. Coyne.